"The unleashed power of the atom has changed everything save our modes of thinking and we thus drift toward unparalleled catastrophes" (Einstein, Lapp. N.Y. Times Magazine August 2, 1964). These words were spoken by one of the most brilliant men in the history of humankind. This genius was the philosopher-scientist Albert Einstein whose discovery of the General Theory of Relativity, the Special Theory of Relativity, and the conversion of matter into energy (the E = MC2 formula), gave us new understanding of the world and the working of the universe. Einstein did not receive much formal education. Therefore his mind was basically free from conditioning, and he was able to do much original thinking. With his brilliant deductions, he solved many of the riddles of the universe for our edification. His Jewish heritage influenced his great thirst for knowledge and his respect for individual freedom. He was at his best when his was communicating with nature and the universe. He left Germany when Hitler took over and tried to rescue as many of his fellow Jews as he could from Hitler' s tyranny. He was also sympathetic to their demands for a Jewish homeland, although he was against their violent tactics. Toward the end of his life Einstein tried to stop the arms race. He advised world leaders to place nuclear energy under international control. He advocated one world government and the rule of law. He believed that the civil rights of all living beings should be respected and honored, and that the resources of the earth should be shared equitably among all its inhabitants. 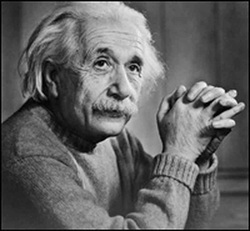 Albert Einstein was born on March 14, 1879 in the city of Ulm in Swabia. His parents were Hermann and Pauline Einstein. They moved to Munich in 1880. Munich in the mountains of Bavaria has been endowed by nature as one of the beauty spots of the earth. It was a tolerant city. Many people who were unhappy in other cities of Germany went there to live and work. Although a Jew, Albert went to a Catholic grade school. Later, he went to Luitpold Secondary School. Even though his parents were not Orthodox Jews, the young Albert learned about discipline, justice, honesty, knowledge, the religion of the Torah, respect for humanity, and the laws of God and nature as part of the traditional Jewish heritage. A shy, sensitive student, Albert did not do well in school and was a problem to his teachers. He did most of his learning at home where he taught himself mathematics, physics and philosophy. He lacked the usual acceptance and happiness which everyone expects from society. This was partly because of his Jewish racial origin. Einstein found inner strength and happiness in the study of nature and the world which he enjoyed immensely. Einstein stated, "There was this huge world which exists independently of us human beings and which stands before us like a great, eternal riddle, at least partially accessible to our inspection and thinking. The contemplation of this world beckoned as a liberation, and I soon noticed that many a man whom I had learned to esteem and to admire had found inner freedom and security in its pursuit" (Sayen.27). When he was 15, Albert was left with friends in Munich while his parents immigrated to Italy. He was supposed to finish school, but instead, he manufactured excuses to leave school and join his family in Italy. He became a high school drop-out for a year and roamed Italy, enjoying the beautiful countryside and the Italian people. Albert had a good time and successfully evaded military service. Being a pacifist, Einstein abhorred the German army. In 1895 Einstein returned to high school in Agrau, Switzerland and applied for Swiss citizenship. Although he graduated from high school in 1896 and from the Swiss Institute of Technology in Zurich in 1900 he could find no job. He worked part time for two years until the Swiss patent office at Berne hired him in 1902. He was by then a Swiss citizen. In 1903 he married Mileva Maric, who was a classmate at the Swiss Institute of Technology. They had two Sons, Hans Albert, born in 1904, and Edward, born in 1910. Einstein worked at the patent office in Berne, Switzerland from 1902-1909. While there he wrote and published his work on the photoelectric effect, a contribution which gained him the Nobel Prize in physics in 1921. In 1905 he wrote and published his Special Theory of Relativity. This theory deals with (among other things), the speed of light and its relationship to time. Light travels at. 186,000 miles per second. This theory helps us understand the structure and relationship of the universe. On earth, light travels so fast that it appears to be simultaneous at various points. Einstein proved that a clock which is in motion with respect to a clock which is at rest, is slower, that is, the period, or interval, becomes longer and longer as it approaches the speed of light, If the clock in motion could attain the speed of light, then its period would become infinite. From mathematics, students learn that infinity can be closely approached but never quite attained. The speed of light therefore, is the unattainable speed and it set limits on the theory. Einstein thus established the idea of relative time, and this idea superceded the Newtonian idea of absolute time. It was postulated that mass and energy are manifestations of the same phenomenon. In 1905, Einstein wrote another paper entitled, "Does the Inertia of a Body Depend upon its Energy Content?" He said that energy in motion (momentum) was decaying (loss) of mass, and that the mass was a lesser mass after it had given up some energy, which energy E was carried away by radiation. He used the formula from two electrons repelling each other F (force) = product of e- charge divided by distance squared. He stated that the amount of mass lost was equal to the energy (E) (carried by radiation) divided by the square of the velocity of light or in his own words "If a body gives off the energy E in the form of radiation its mass diminishes by E/C2" (Bernstein.98). and since the speed of light is so great (186,000 miles per second) it makes the tiny loss of matter very significant when converted into energy. This same theory can be applied to the fusion of isotopes of hydrogen into helium when a very small mass is lost and this loss is converted into radiant energy. This explains how the sun and other stars can give so much energy for so long a time. In 1915 Einstein postulated his General Theory of Relativity in which he explained that light rays (energy in an electro-magnetic field) will be bent by gravity. Study of the bending of light rays and of the gravitational rod shift of the sun and other stars have led to the theory of the expanding universe. He also deducted the perihelion shift Thus Einstein changed our concept of the world and the universe. As the mathematician David Hilbert said, "Do you know why Einstein said the most original and profound things about space and time that have been said in our generation? Because he had learned nothing about all the philosophy and mathematics of time and space" (Bernstein 115). In other words, Einstein used his own original thinking patterns when trying to comprehend the universe. He taught us that there is no absolute time but relative time; that there is no empty space but space occupied by gravitation and electro-magnetic charges; that there are no straight lines in the motion of light in space but rather a warping or slight curvature due to the binding of light rays; and that the universe is not static but dynamic and expanding in space. He helped us see the orderliness and simplicity of creation; its mystery and puzzle as to who started it all and why and where it is headed. As he himself said in 1926, `The Theory accomplishes a lot, but it does not bring us close to the secrets of the Old One (God). In any case I am convinced that he does not play dice with the universe)" (Bernstein.192). From 1909 through 1913 Einstein accepted positions in Zurich and Prague. In April 1914 he moved to Berlin as head of the Kaiser Wilhelm Society for the Development of Science. Shortly afterwards, in August of 1914, World War I broke out Einstein hated war and all the killing, pain and suffering that it brought. He was one of the authors of the Manifesto to Europeans, which called for the cessation of hostilities, the return to peace, the formation of one country out of all the countries in the continent of Europe, and one central united government for all. Europe could then stop the mad narrow nationalism that causes wars. He was a non-violent man and a pacifist. He explained at the outbreak of World War I, "Europe, in her insanity, has started something unbelievable. In such times one realizes to what a sad species of animal one belongs. I quietly pursue my peaceful studies and contemplations and feel only pity and disgust. He who cherishes the values of culture cannot fail to be a pacifist" (Bernstein. 140). In 1914 his wife took their sons and moved to Switzerland. Overwork (he wrote thirty papers in 1914-1918), depression and lack of care made him ill. Luckily, his relatives found him and ministered to him. They nursed him back to health and life. His cousin Elsa Einstein Lowenthal was his chief nurse and he married her after divorcing his first wife. The severance of contact with his children greatly distressed him. It was one of the causes for alienation from his sons in later years. In 1919, after the end of the First World War, he was offered a professorship in Leyden. He refused it, since he wanted to live among his Jewish people in Berlin and share their fate. Einstein was conscious of their plight but thought things would get better for the Jews under the new Weimar Republic which promised civil rights and equal treatment. "A moral attitude to life, love of justice and knowledge, and a desire for personal independence were the ideals that make me thank my stars that I belong to the Jewish Tradition" (Sayen.41). It was also in 1919 that a British Expedition photographed the total eclipse of the sun. It proved the bending of the rays of light near to the sun, due to the gravitational attraction of the sun. So Einstein's General Theory of Relativity replaced Newton's theory of empty space (absolute time and space). Einstein captured the imagination of the world. Not only was he the greatest living scientist of the time, but he was also a good and humane person. His unassuming appearance, his great modesty, his work for downtrodden people and his non cooperation with war made him a hero to a world looking for one. Einstein traveled abroad to America, England, Palestine and Japan. He lectured and tried to raise money for the Jewish cause. He supported the Jewish leaders in their quest for a homeland for the Jews. But he did not want a separate Jewish state to be carved out of Palestine. Rather, he favored a state where the Arabs and Jews could live side by side in peace and share the government together. He did not want a political Jewish state but he wanted the restoration of the culture of the Jewish people in the surroundings where their heritage once flourished. After the First World War, he was convinced that the Jewish people's desire to be assimilated and accepted in the country where they lived was not to be realized. The Jews were still treated as strangers. They were used as escape-goats whenever problems arose, or economic conditions were depressed, or ultra conservative and/or ultra nationalistic groups seized power. Einstein was also afraid of anti-Semitism and persecution. Einstein himself experienced the loneliness of not belonging to the Gennan national culture, and not being accepted for what he was. He also felt that the Jews needed a place of refuge, a place where they would have room to grow morally and spiritually, a place where they could renew their pride, and be free of intolerance and persecution. Palestine was more important to him because of its moral implication rather than for its political standing. For ten years the Weimar Republic of Germany ran a democratic government in which people prospered. But the humiliation of the Treaty of Versailles, the war reparation payments that Germany made to the Allies and the great economic depression of 1929 dealt a death blow to that democratic coalition government. The ultra National Socialist Party, the generals and the industrialists gradually took over the German government. With the ascendancy of Hitler and the Nazi Party in 1933, things went front bad to worse for minority people and minority tights. Hitler started his preparation for war and his persecution of the Jews. Einstein was proscribed and his property seized in Berlin. Thus he could live there no longer. He walked to his laboratory in the campus in the morning. After discussions with his assistants he started his day's work. After lunch he caught the campus bus for the trip back home. There he spent his time working or studying in his upstairs quarters. He avoided the limelight and did not grant interviews. His secretary answered the mail, talked to visitors and screened him from outside contact. He worked mainly on the Unified Field Theory. He was very helpful to his younger colleagues, and was the favorite of the children of the neighborhood. His life was simple and unostentatious. He did not care about clothing, wealth, possessions or fame, and he could be best described in the words of Thoreau, "that a man is rich in proportion to the number of things which he can afford to let alone." In Einstein's own words, "It would be a sad situation if the bag was better than the meat wrapped in it" (Sayen.68). He enjoyed living in the United States. He liked the individual freedom and the citizen's right to criticize his government. He did not like America's insatiable desire for material things or the control of education by big business. When things bothered him he spoke up. The authoritarian government of Germany and its war preparations caused him to write in 1933 "Germany is obviously pushing towards war. . .Things would be far worse than in 1914 .were I a Belgian, I should not, in the present circumstances, refuse military service...This does not mean that I am surrendering the principle for which I have stood heretofore. I have no greater hope than that the time may not be far off when refusal of military service will once again be an effective method of serving the cause of human progress" (Bernstein.213). Einstein applied for U.S. citizenship in 1935 and it was granted in 1940. On December 20, 1936, his wife Elsa died. He was left alone with Margot, his step-daughter, and Helen Dukas, his secretary. He became lonelier than ever. The Jews were feeling the brunt of Hitler's persecution in the late 1930's. Einstein sponsored many Jews who wanted to immigrate to the U.S. The quota established by the U.S. for the years 1934-1937 was 25,000 per year. This was very low considering the fact that about 4 million Jews were trapped in Nazi Germany. Einstein could not persuade the American government to admit more Jews. President Roosevelt was sympathetic but he could not do it alone. Congress, following the lead of Senator Breckenridge Long, did nothing to improve the quota situation. Millions of Jews were left at Hitler's mercy. At the outbreak of the Second World War in 1939, Einstein wrote a letter to Roosevelt warping him about the German Scientists' progress in splitting the atom and releasing tremendous energy, which might be used in a bomb. However, at that time the concept was all very theoretical. Einstein answered criticism of his letter to FDR by saying, "It would have been ridiculous to attempt to conceal the particular conclusion resulting from the Special Theory of Relativity. There was, never the slightest indications of any potential technological application but man's ethical and social qualities have been unable to utilize the fruit of science in a human manner" (Sayen 119). Meanwhile, the carnage of World War II went on from September 1, 1939 until August 8, 1945, including the systematic murder of millions of Jews in Nazi concentration camps. President Roosevelt ordered Henry Morgenthau Jr., Secretary of the Treasury, to investigate the Jewish problem. Morgenthau wrote a report entitled "Report on the Acquiescence of this Government in the Murder of the Jews." FDR then appointed the War Refugee Board in January The last years of Einstein's life were occupied by his efforts at controlling the arms race, promoting one world government, working for international peace and saving the world from the follies of its rulers. He called for the general disarmament of all nations, and eschewing of military solutions to international problems. He thought that military confrontation was childish, immature,. and out of keeping with present-day reality. If peaceful methods of problem solving cannot prevail, then, he predicted that the 4th World War will be fought with stick and stones by our descendants, that is, if anyone survives the preceding nuclear exchange. Einstein petitioned Congress and the President of the United States to share nuclear power with the U.S.S.R., to put nuclear bombs under international control, to open nuclear facilities for inspections, to give up monopoly of atomic weapons and to eventually abolish them altogether. Einstein spoke up for a world government, and the discontinuance of national borders and national causes. He wanted one government to govern the world for the benefit of all mankind and the cessation of international war. In this way one group would not live at the expense of another, but would share equally in providing for the needs of the body, mind and spirit of every living thing. One unified world government would be given the power to keep the peace. All nations would submit to the universal authority and world law would prevail. World law would be dispensed by a World Court and all disputes would be peacefully arbitrated by it. This system would of course develop slowly. It would take time before nations mature to the point of giving up control over narrow interests for the good of the broader interests of all humankind. Political maneuvering would not save humankind. Only a sincere concern for the fate of the earth, for the continuation of life and for the survival of civilization can save the world from the present peril. In 1949 Prime Minister Nehru of India visited Einstein and paid him homage from the Indian people. It is possible that this visit strengthened the Prime Minister's nonaligned policy and his resolve to stay neutral and not be drawn into the sphere of influence of either the eastern or western Big powers, but to serve as a buffer between them. Nehru also tried to spread this noninvolvement in the East-West power struggle (cold war) and so extend the area of peace to other poor countries of the third world. In 1952, Einstein was diagnosed as suffering from an aortic aneurysm. This slowed him down a little but he still played the part of a pin prick on the conscience of the world leaders. He said, "I have become a kind of infant terrible due to my inability to keep silent and to swallow everything that happens here. . .In all cases where a reasonable solution of difficulties is possible, I favor honest cooperation and, if this is not possible under prevailing circumstances, Gandhi's method of peaceful resistance to evil" (Sayen.267-268). At the celebration of the 25th birthday of the Institute for Advanced Study in Princeton in April, 1955, Einstein appeared weak and failing. His aneurysm began leaking on April 13th and he was hospitalized. He son Hans and his friend Otto Nahan came that very evening. He was happy and alert to the very end. He died April 18th, 1955.